A Banzai Bill Cannon shooting a Banzai Bill in New Super Mario Bros.
Banzai Bill Cannons are large Bill Blasters that first appear New Super Mario Bros. Like Bill Blasters, they slowly shoot Banzai Bills. They appear only at the end of World 7-5 and World 8-1 and help the player reach the tops of the flagpoles. 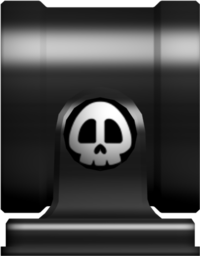 They also make an appearance in Super Mario Galaxy's final level, Bowser's Galaxy Reactor, New Super Mario Bros. Wii, Super Mario Galaxy 2, Super Mario 3D Land, New Super Mario Bros. 2, Super Mario 3D World, New Super Mario Bros. U, New Super Luigi U, and Super Mario Odyssey. In New Super Mario Bros. games that use 3D models for Banzai Bill Cannons, their full model is only the visible half-portion of the cannon. In Mario & Luigi: Bowser's Inside Story, before Fawful took over Bowser's Castle, Private Goomp, Corporal Paraplonk, and Sergeant Guy were able to salvage a Banzai Bill Cannon, and escaped with it. Bowser later encountered the group carrying the cannon through the forest, and they told him that they were going to launch a Banzai Bill at the castle, though he then learned that they had no Banzai Bills. After Bowser recovered one from Wiggler, they launched it at the castle, though before it could make contact, Midbus had the castle float into the air, efficiently dodging the Banzai Bill. In Paper Mario: Sticker Star, Bowser Jr. uses a Banzai Bill Cannon aboard his airship in World 6-2. At one point to progress, Mario has to Paperize the Banzai Bill Cannon scrap and turn it around, causing it to blast a hole through the ship and subsequently break down. It originally would have been a fightable enemy, but was cut. In Paper Mario: Color Splash, Banzai Bill Cannons appear in Black Bowser's Castle. They are used to fire Banzai Bills filled with black paint. When Mario blows up Bowser's black paint factory, the Cannons start firing Banzai Bills the same way they do in other games. In Mario & Luigi: Dream Team, the Sergeant Guy Cannon resembles a Banzai Bill Cannon and is used in the battle against the Elite Trio. Sergeant Guy uses it in one of his attacks, taking two full turns to have it prepared. In the first turn, the Banzai Bill is manually loaded into the cannon by a few Shy Guys. On the second turn, it gets launched. Banzai Bill Cannons return in Super Mario 3D World and Super Mario Odyssey. They act the same way as they did in previous titles. 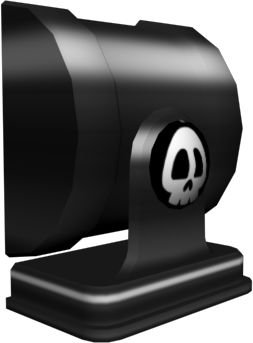 Banzai Bill Cannons appear as course elements in Super Mario Maker 2 in the Super Mario 3D World style, where they can be placed in the background launching Banzai Bills towards the screen. This page was last edited on March 3, 2019, at 12:29.